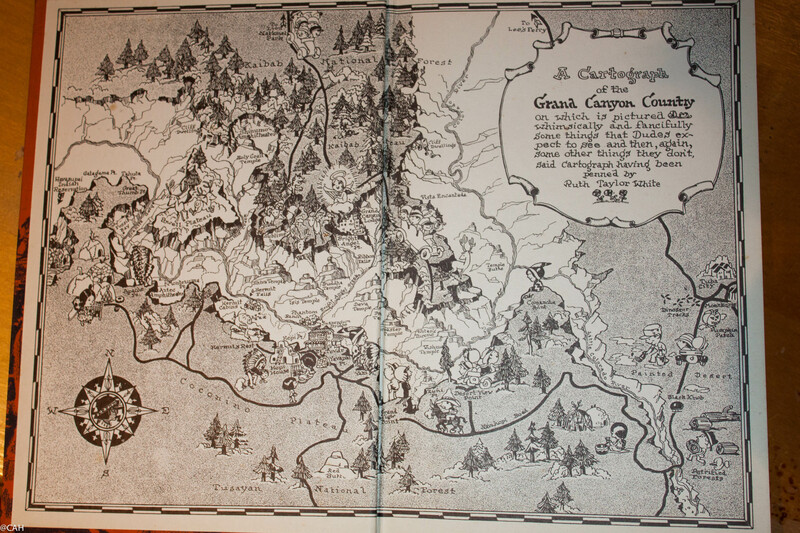 I picked up a book today ‘Grand Canyon Country’ written by the Superintendent of the National Park and published in 1935. It is fascinating to compare the description of the area then with it as we found it in 2013 on our short visit. A lovely feature of the book is the cartograph by Ruth Taylor White inside the covers ‘on which is pictured whimsically and fancifully some things that Dudes expect to see and then again, some other things they don’t’. I certainly plan to return one day and see the North Rim and take a mule trip down the Kaibab Trail with an overnight stop at Phantom Ranch – described in 1935 and still something you can do. We did drive through the Painted Desert in 2013 but other nearby places to visit are Zion National Park and the Petrified Forest which will have to wait for the next trip.